With leagues across Scandinavia rounding out their regular seasons, it is put-up or shut-up time for players across northern Europe, and our band of locals are largely in the put-up camp. Hottest of all in that cold, cold region is Bobby Warshaw of Swedish side Ängelholms FF. On loan from FC Dallas, the Mechanicsburg, PA native had a monster match this weekend against IFK Värnamo. Losing only once in their last nine games (which happened to be the only game in which Warshaw did not take the field after breaking into the team’s lineup), Ängelholms squared off against a Värnamo side fighting to avoid relegation. Warshaw gave Ängelholms the lead just 14 minutes in, but just two minutes later an equalizer would leave the teams tied at the half. Coming out of the locker rooms on the front foot, Warshaw would again give his side the lead four minutes after thje restart. The demoralized Värnamo side would then give up two more (including an own goal) before Warshaw would put the icing on the cake with an assist for teammate Mikael Dahlgren in the 88th minute. Though Ängelholms would give up a consolation goal in stoppage time, the side would call it a night with an impressive 5-2 win in their back pocket. Warshaw now stands at five goals and one assist in six appearances for Ängelholms. Down the Swedish soccer pyramid, Philadelphia’s own Anthony Allison also made a mark in his match over the weekend, providing Umeå FC with their only goal as a second half sub in Sunday’s 1-1 draw at Carlstad United NS. Finally, Marlboro, NJ native Alex DeJohn played his last game of the season with Finnish side Ekenäs IF. Despite ending the season at the top of their division, DeJohn and Ekenäs missed out on promotion to the Finnish first division after a devastating 2-0 playoff loss this Saturday to FC Jazz. Over the course of the season, DeJohn racked up 26 starts, 1 goal, and contributed to 12 of his team’s clean sheets. Greg Cochrane, D, Los Angeles Galaxy — Did not play on Wednesday. Started and played 90 minutes in Sunday’s 0-0 draw with San Jose. Season: 11 games, 8 starts, 3 clean sheets. U.S. Open Cup: 1 game, 1 start. Bobby Convey, M, Toronto FC — Did not play. Season: 23 games, 21 starts, 1 goal, 4 assists. Ryan Finley, F, Columbus Crew — In the 18, but did not play. Season: 13 games, 3 starts, 1 goal, 1 assist. U.S. Open Cup: 0 games. Antoine Hoppenot, F, Philadelphia Union — Played 23 minutes in Saturday’s 2-1 loss at Montreal. Season: 29 games, 1 start, 3 goals, 1 assist. U.S. Open Cup: 1 game. Jeff Larentowicz, M, Chicago Fire — Started and played 90 minutes in Saturday’s 1-0 win over Toronoto. Season: 32 games, 31 starts, 2 goals, 4 assists. U.S. Open Cup: 3 games, 1 start. Jeff Parke, D, Philadelphia Union — Started and played 90 minutes in Saturday’s 2-1 loss at Montreal. Season: 30 games, 30 starts, 9 clean sheets. U.S. Open Cup: 2 games, 2 starts. Andrew Wenger, F, Montreal Impact — Started and played 90 minutes in Wednesday’s 1-0 loss to Los Angeles. Played 37 minutes in Saturday’s 2-1 win over Philadelphia. Season: 21 games, 9 starts, 1 goal, 3 assists. Canadian Championship: 4 games, 4 starts, 1 goal. Dan Gargan, D, San Jose Earthquakes — Did not play. Tournament: 3 games, 3 starts, 1 clean sheet. Corey Hertzog, F, FC Edmonton — On loan from Vancouver, started and played 90 minutes in Sunday’s 1-1 draw at New York. Season (Edmonton): 11 games, 11 starts, 2 goals. Season (Vancouver): 7 games, 6 starts, 1 goal, 1 assist. Canadian Championship (Vancouver): 2 games, 1 goal. Jeremy Vuolo, GK, San Antonio Scorpions — Started and played 90 minutes in Saturday’s 1-0 loss at Tampa Bay. Season: 11 games, 10 starts, 11 goals against. U.S. Open Cup: 0 games. Jon Okafor, M, MYPA — Played 27 minutes in Sunday’s 1-0 win at RoPS. Season: 30 games, 15 starts, 2 goals, 1 assist. Russell Canouse, M, Hoffenheim — Started and played 90 minutes in Sunday’s 3-1 loss to SC Freiburg. Season: 6 games, 6 starts. 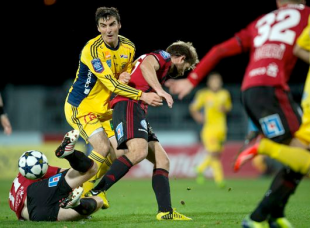 Zarek Valentin, D, FK Bodø/Glimt — Started and played 90 minutes in Sunday’s 2-0 win at Kristiansund. Season: 24 games, 24 starts, 13 clean sheets. Cup: 3 games, 3 starts, 1 clean sheet. Bobby Warshaw, M, Ängelholms FF — On loan from FC Dallas, Started and played 90 minutes in Sunday’s 5-2 win over IFK Värnamo, scoring goals in the 14th and 49th minutes, and providing an assist in the 88th minute. Season (Ängelholms FF): 6 games, 6 starts, 5 goals, 1 assist. Cup (Ängelholms FF): 1 game. Season (Dallas): 8 games, 1 start. Anthony Allison, F, Umeå FC — Played 45 minutes in Sunday’s 1-1 draw at Carlstad United NS, scoring a goal in the 66th minute. Season: 19 games, 13 starts, 3 goals, 1 assist.